The cryptocurrency market quietly bounced back over the past week as a number of positive events occurred within the industry. The market still has quite a ways to go to recover the losses incurred in 2018 but it looks like the bloodbath is over. Topping the list was a pair of enforcement actions from the SEC. The two actions, the first of their kind, were a shock to markets at first but upon reflection may lead to the much anticipated BTC ETF. The first action was against Crypto Asset Managemet, a California company advertising the first-ever SEC approved cryptocurrency fund. The company was fined for false advertising, operating an unregistered investment company. The second was against the ICO Superstore, a website offering investments in hot ICO products. It’s operators were charged with operating an unregistered broker/dealer and have been banned from operating investment based businesses in the future. Some, myself included, speculate the move means the SEC is clearing the way for cryptocurrency regulation. The Gemini Exchange, a US regulated banking institution and cryptocurrency exchange (owned by the Winklevoss Twins) issued a stable coin based on the US dollar. The stablecoin, called the Gemini Dollar, is built on the ERC-20 protocol and important for two reasons. The first is that it is the first and only US regulated stable coin based on the USD. This means traders can buy and sell crytpocurrency on global exchanges using the USD. The second is that it is built on the Ethereum protocol which is a much needed vote of confidence for the network. Ethereum has been suffering growing pains and may face obsolescence if it can not solve scaling issues and transaction speed issues. Regardless, the Gemini Dollar is another step in the process of building up a safe, regulated cryptocurrency infrastructure in the United States. US investment manager EFHutton announced it would raise capital to the tune of $60 million using multiple cryptocurrency based investment vehicles. The company says it understands the value in cryptocurrency comes to utility and how investors may benefit, promising a use-case for each vehicle that will encourage investors to hold them. Hutton has hired an adviser with experience in the ICO realm and is expected to launch the products January of 2019. Hutton has also recently announced sponsorship of the newly formed and US regulated ACEx cryptocurrency exchange. Bitcoin dominance topped 55% over the last week as all these other events were going. Bitcoin dominance is a measure of Bitcoin’s market share relative to the cryptocurrency market and shows it is still the world’s reserve cryptocurrency. The high level is also a positive sign the coin will soon begin to rise again as trading volume has also been elevated. 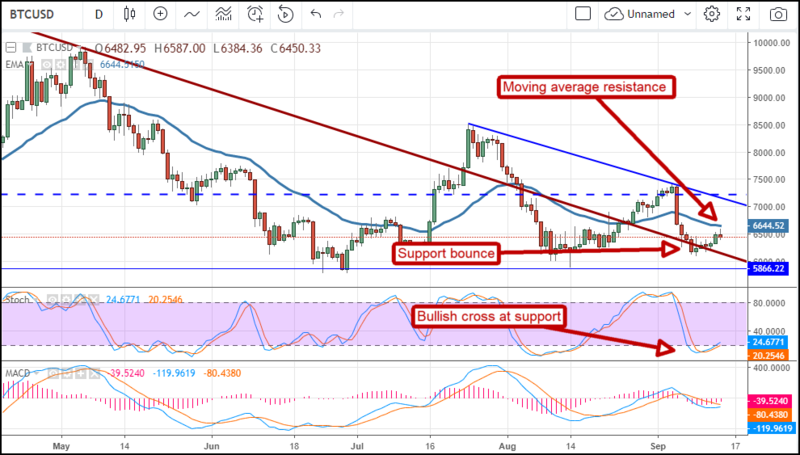 Bitcoin is now trading above $6,500 and is indicated higher although resistance is present at the short-term moving average. A move above resistance will be bullish and likely take the coin up to retest $7,000.